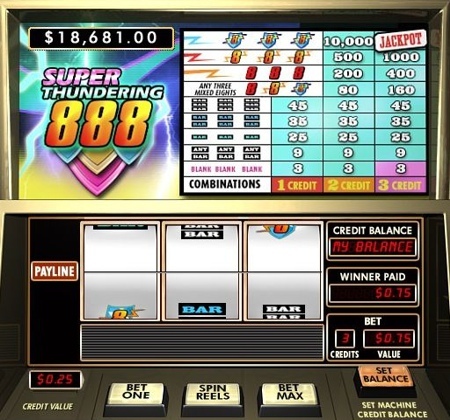 Super Thundering 888 is a classic 3 reel, single payline slot machine game with progressive jackpot. Coin size is fixed at 0.25 credit and you can bet 1 to 3 coins, up to 0.75 credit per spin. Top base game jackpot is rather large - 10,000 coins for 3 "Super Thundering 8" symbols if you bet 2 coins,nothing (!!) for 3 "Super Thundering 8" symbols if you bet 1 coin or Progressive jackpot on 3 coin bet. This is definitely the slot where you should always bet max 3 coins, because the paytable contain a lot of empty spaces for smaller bets. The winning combinations can be composed with the following reel symbols: Super Thundering 8, Thundering 8, Regular 8, mixed 8's, 3 types of Bars, mixed Bar combination, and even Blank spaces. 3 "Super Thundering 8" symbols with 3 coin bet wins you the progressive jackpot. You can win growing jackpot with max bet ($/€0.75) only.